William Hill is one of the largest gambling operators on the globe, with business in many countries. They are listed on the London Stock Exchange under ticker WMH with a market cap of almost 2.9 billion dollars. William Hill has been around for a very long time and as a result has become a market leading innovator across all segments. 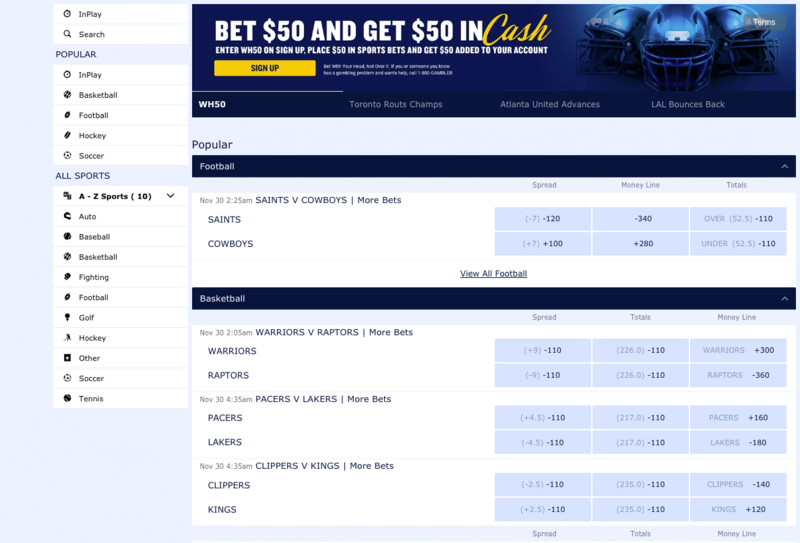 It’s largest offering is in sports betting and today’s article focuses on what they offer on that front. William Hill currently operates in Nevada and New Jersey. This article reviews William Hill New Jersey. I have broken down William Hill’s offer into the below criteria and scored accordingly. I will then evaluate every criterion in further details below. William Hill Sports offers a welcome bonus that involves betting a minimum of $50 to receive $50 in free bets. This bonus can also be referred to as a first deposit bonus and is only available to new users using the correct William Hill promo code. The minimum deposit amount to qualify for the bonus is $20. Open a new account at William Hill New Jersey Sportsbook – on desktop or mobile. Place cumulative sports wager of minimum $50. Once that qualified bet is placed, William Hill will award you $50 cash that you can use in accordance with the terms and conditions. William Hill New Jersey bonus offers is pretty generous and a nice welcome to get to know the sportsbook. William Hill Sports has a range of markets and events available to bet on that it is borderline silly at times. You name it, they will let you bet on it. In fact, users can propose a bet to the team via the William Hill twitter account, who will then do what they can to offer that market. It is this form of customisable service that makes William Hill the powerhouse that it is. As you can see there is certainly no shortage of action and to be honest, if you can name it, they will bet on it. William Hill will also offer promotions such as price boosts and other exotic ways to give some value back to customers. Regularly review the promotions page to keep up to date with all the fun stuff they make available. William Hill is such a large organisation that generate billions in revenue, that it has the capacity to operate with slimmer margins than most, in the quest for continued growth in market share. As a result, they are always very competitive in framing markets. The fact is however, that with literally thousands of markets available it is impossible for any 1 bookmarker to always offer the best odds for any bet on any event. I find that sometimes however their odds on these markets are not as good. I guess that having the physical betting stores allows them the opportunity to frame markets at higher margins, as customers of those stores are less likely to be shopping around. It is worth mentioning that William Hill allows users to receive an Odds boost on 1 bet per day so always remember to calculate that into your thoughts. It is always a good idea to shop around a little before committing to a bet. With so many markets and events there is value to be had to using an odds comparison type procedure to make sure you do not leave too much value on the table. The William Hill Sports app is available in both iOS and Andriod versions and can be downloaded from the iTunes store and Google Play Store respectively. The William Hill app is available in English, German, Greek, Japanese, Russian and Swedish languages. The great thing about this app is that all the markets and events available on the website, are also available within the app. Live streaming and live betting are also available within the app as well as fully functional account management. Overall this app is fantastic. When you consider that there are thousands of markets and events to navigate through, the fact one can find what they want quickly and efficiently is amazing. William Hill is a leader in the innovation of live betting and has recently included live streaming as well. These 2 features together enhance the user experience exponentially and make watching sports more enjoyable than ever. Live Betting is available on a very large range of markets and sports. A Cash In feature allows players to settle on their bets before the event has finished, which locks in profits. That flexibility certainly has a lot of value to me as a heavy football bettor, where we all know that anything can happen in the dying minutes of a match. Live Streaming is not available on as many events as Live Betting, although I suspect that has more to do with the fact that a lot of events are simply not broadcast anywhere, than with William Hill not wanting to stream it. Conditions for access to live streaming varies on the event. Horse racing for example requires users to have placed a bet of at least £1 before they can watch that specific race. Soccer however only requires a user to be logged into their account for access. There are however territory restrictions placed on William Hill by whoever owns the broadcast rights to specific events, which may also affect one’s ability to watch live. Being a global player for such a long time, William Hill Casino has outstanding customer service. They staff their service team to run globally around the clock so help is never too far away. Live chat is the fastest and most efficient way to get a question answered. Also on offer is free calls from both inside and outside the US. Players can always send through a question via the messaging system as well. All 3 methods are extremely efficient and I found staff to be helpful and courteous on all occasions. William Hill Casino has a robust and in-depth FAQ section for those wishing to help themselves. William Hill Sportsbook New Jersey offers a huge variety of payments options including credit card, wallet and bank transfers. Deposits are for the most part instant and William Hill casino has fast withdrawal processing times. They do not however players the facility to transact using e-Wallets such as Neteller, Skrill or Paypal. Also, William Hill does not yet offer Bitcoins or other crypto currencies as a payment option yet, and as a result I must assign a rating of 4/5. See below table for a list of payment options along with important information for each. William Hill is a leader in the market for all things relating to sports betting. 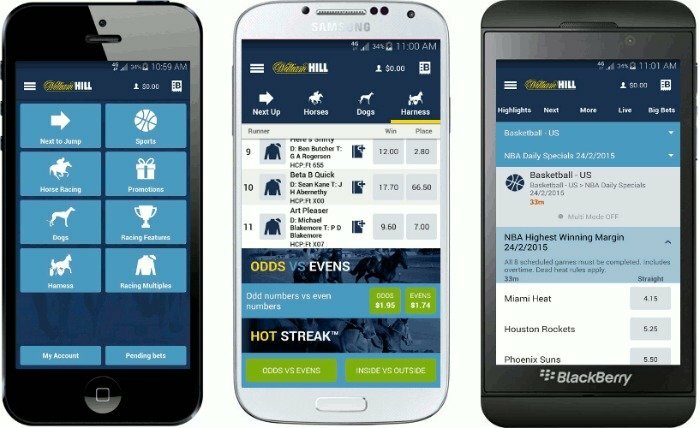 The range of markets, mobile apps and live betting/streaming options make William Hill a great pace to wager. Remember to take advantage of that great welcome bonus by making your first deposit.